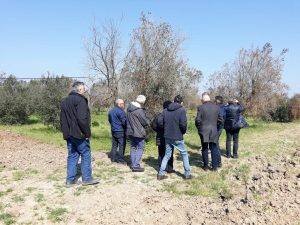 Following the visit of last year, on March 21, 2019, Gianfranco Colleluori (Deputy Head of Unit “Italy-Malta”) and Andrea Incarnati (Desk Officer Puglia) of the Directorate-General for Agriculture and Rural development of DG-AGRI visited the area of the Apulia region demarcated as “infected” and affected by the epidemic spread of Xylella fastidiosa. The visit, organized by Luca Limongelli, Managing Authority (AdG) of the regional Rural Development Program (PSR) of the Apulia Region, was an opportunity for the EU delegates to see the impacts and the consequences of the spread of the devastating bacterial infections for the whole agriculture sector of the area (olive industry, nursery productions) as well as the social and environmental implications. During a tour of the region, the EU delegates visited a nursery of the district of Fasano (area of containement), being among the major producers of vegetable seedlings and offinical plants, and two major outbreaks of the bacterium in the municipalities of Carovigno and Oria. 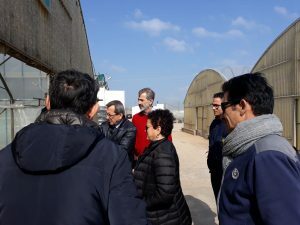 The visiting team included, besides Luca Limongelli, Giuseppe Tedeschi, and Anna Percoco of the Regional Plant Protection Service, Donato Boscia on behalf of the scientific community, and Cosimo Cavallo, of the Plant Protection Service of the Brindisi province, who was the tour guide.